WOMEN LEADERS AT WORK Shows How Female Leaders Succeed, Providing Advice and Explaining How They Faced Challenges. “WOMEN LEADERS AT WORK shines a light on women. Today’s leaders who are women, who are changing our world, even as examples, inspire young women who are our leaders of the future.” -- Frances Hesselbein, former CEO of the Girl Scouts of the USA. Apress’ latest addition to its popular AT WORK series, WOMEN LEADERS AT WORK: UNTOLD TALES OF WOMEN ACHIEVING THEIR AMBITIONS chronicles the success stories of talented businesswomen, using a question and answer format to demystify their rise through the ranks. By sharing the wisdom and astute advice of 18 amazing contemporary women in leadership, WOMEN LEADERS AT WORK provides an up-to-date guide for ambitious people seeking professional success. 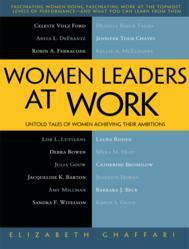 “WOMEN LEADERS AT WORK shines a light on women. Today’s leaders who are women, who are changing our world, even as examples, inspire young women who are our leaders of the future. Great book!” says Frances Hesselbein, President and CEO of the Leader to Leader Institute, and former CEO of the Girl Scouts of the USA. Featuring interviews from IBM’s Jeanette Horan and California’s Secretary of State, Debra Bowen, WOMEN LEADERS identifies personal strategies for addressing challenges to meeting career goals, and shares how to be aware of the subtle factors that open up doors along the way. The book details key actions and decisions that will help women reach the executive level, win public office, or achieve professional recognition and status. “This is a book for career-oriented professionals, women and men alike,” says author Elizabeth Ghaffari. “It’s for those who want to understand what it takes to make it to the top and what to do once there.” Readers will gain a range of examples and experiences they can use to achieve their own goals. WOMEN LEADERS is part of Apress’ best-selling AT WORK series, which includes inspiring titles that offer real-world insight to how talented businesspeople achieve success. The series includes best-selling books such as FOUNDERS AT WORK: STORIES OF STARTUPS’ EARLY DAYS by Jessica Livingston, and CODERS AT WORK: REFLECTIONS ON THE CRAFT OF PROGRAMMING by Peter Seibel. Elizabeth Ghaffari is the founder, president, and chief executive officer of Technology Place Inc., a California-based company that provides technical consulting services for business clients. Ghaffari also runs Champion Boards, established to foster the design of great boards of directors, with a special emphasis on the advancement of top-level women. The author of Outstanding in their Field: How Women Corporate Directors Succeed (Praeger, 2009), she also writes for major business journals and blogs. Ghaffari received her master’s degree in management from the Anderson School of Business, University of California at Los Angeles, and her bachelor of science degree in political science from The American University in Washington, D.C.
Apress Media LLC is a technical and business publisher devoted to meeting the needs of IT professionals, software developers, programmers, and business leaders with more than 1,000 books in print and electronic formats. Apress provides high-quality, no-fluff content that helps serious technology professionals build a comprehensive pathway to career success. For more information about Apress' innovative approach to publishing, please visit http://www.apress.com.